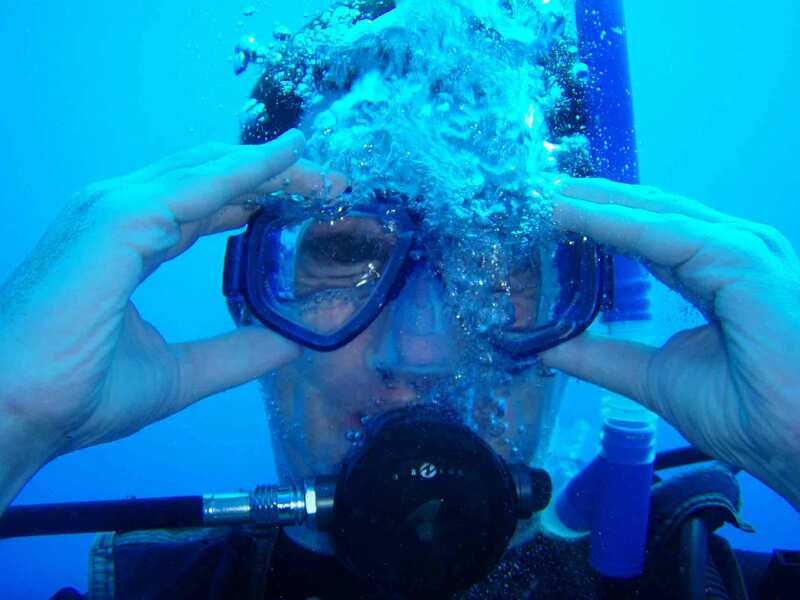 Mask skill is one of the most essential skills as an individual diver. It’s near impossible to avoid water getting inside your mask during a dive, not to mention that we forget to defog the mask before diving and it gets foggy during the dive. Luckily, during our open water training, we will learn various mask skills ranging from the very basic up to the more advanced. In real life, people would not go up to the surface to fix the mask (either the mask is getting foggy, or it’s not in the right position, or maybe your hair got stuck that will require you to remove the mask-fix your hair-and replace the mask back). They will fix all those problems during the dive, and that is exactly why we learn those skills. The key to mastering this skill is patience and composure. Many people rush to do this skill and it just creates extra problems for themselves, especially underwater. It takes time to be comfortable on having the water inside your mask, and you should take your time in doing this skill. Calming yourself down before doing this skill can make a big difference, and controlling your breath will help you achieve that. By inhaling and exhaling slowly and deeply, you will help to make yourself calm to execute this skill. As you are doing that, you can think of the steps of the mask skill. Take a couple of breath before you let the water inside, and let the water sit inside the mask for a while so you can be familiar with the feeling. This procedure involves letting water inside your mask to simulate real underwater conditions. There are various ways of doing it. Pinching the mask skirt can give you more control over how fast the water flows inside the mask. Or maybe you would want to have a firm grim over the mask frame, and slowly open it from the top so you can get more familiar with the mask structure. It sounds frightening, but it’s not really. Before doing it underwater, people can try to just breathe for a minute or two at the surface without mask, before slowly putting the face in the water so you can really concentrate on the breathing only. It puts people to become more focused on the breathing and getting used to have water on their face. While most instructors will suggest that it’s better to open your eyes underwater, some people may find that it hurts or maybe feel intimidated by the idea. What you can try is closing your eyes as you are doing the skill, and try to really feel the water that is inside your mask. By doing this, you can avoid hurting your eyes and gradually get used to having water inside the mask. Holding the top of the mask frame and exhaling through your nose as you’re looking up is the standard procedure on clearing the mask. By doing this, you’re really making sure that water can escape. But if that sounds intimidating, or just too much to remember then we have other suggestions. What you can also do is to hold the top of the mask frame (either from the side or the middle) and exhale through your nose as you keep your head vertical. This way, you can cut down one step. Each individual will have their own ways of approaching this skill. As long as you understand the basic concept, you can make minor adjustments to suit your method of doing it. For some people, they can do it in one go and have no problem at all. But for some, it can take some time to be comfortable with the mask skill. Because diving is safety fun, it’s best to practice the mask skill until you get really comfortable with it. Be honest with your instructor and tell them what’s on your mind should you feel discomfort doing this.